When Riccardo Muti took the podium on Sunday night, he was not in his usual tuxedo. Instead, the venerated maestro—whom The New York Times recently hailed as “the King of Verdi”—looked at ease in a plum pullover sweater and khakis. Before picking up his baton, he turned to the audience and cracked a few jokes, speaking a hybrid of English and Italian. Muti, a veteran conductor known for his stern and stoic conducting style, showed off a more playful side at Sunday’s open rehearsal with the Civic Orchestra of Chicago, the city’s premier pre-professional orchestra for college and graduate students. 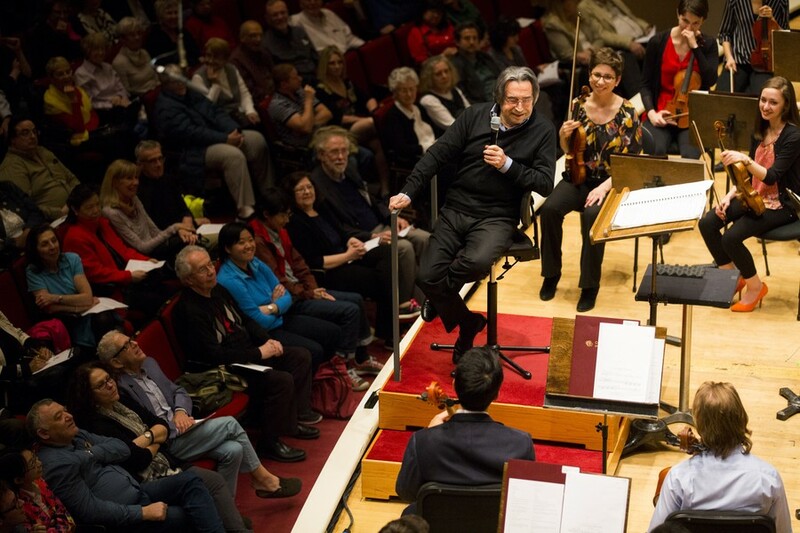 “I’m sure they will play at the beginning the way it should not be played,” Muti said to the audience before leading the orchestra in Verdi’s The Four Seasons. The young musicians chuckled. Despite Muti’s joking nature, however, it was clear that he expected nothing but excellence from Civic, who played the difficult piece exceedingly well for an ensemble of its age group. Muti held the Civic musicians to the same standard to which he holds the Chicago Symphony Orchestra (CSO). A trumpet solo in the first movement, “Winter,” was repeated nearly five times before the maestro was pleased. The quality and lyricism of the end result, however, was truly magical. During a quiet, sensitive passage in “Winter,” someone in the audience sneezed, to which Muti replied, “Always during the piano passages!” He joked about how audiences all over the world never feel the need to cough or sneeze during forte, boisterous portions of pieces. At the end of the movement, a cheerful, celebratory melody, the orchestra soared; in response, a delighted Muti remarked that young people play with a markedly different amount of enthusiasm than do jaded professional musicians. “Spring,” the second movement of the piece, is more reminiscent of a small clarinet concerto than an orchestral work. Unusually, Muti let the principal clarinetist, JJ Koh, lead the orchestra, and Koh rose to the occasion: his tone was bright, even, and controlled even during the pianissimo portions in the altissimo register. Muti and the audience were pleased—the soloist received lengthy applause. During “Summer,” the principal oboe’s chance to shine, Muti also offered compliments to the soloist and the ensemble. There were moments when the Civic bore more resemblance to the CSO more than to a training orchestra; their expressivity was at times even more vibrant than some recent CSO performances. Perhaps the most exciting moment of the rehearsal came at the end of “Summer,” a point in which the melody jumps, note by note, between string families in a frenzy of bowing and lush harmonies. Their precise execution was not lost on Muti: he stopped and turned to the audience, face aglow with joy, as the musicians played. After the last movement, “Fall,” the Maestro made sure to shake hands with every first-row musician. When the cheering quieted, Muti turned to the audience, thanking them for their ongoing support of classical music and expressing his hope that they would continue to support this next generation of artists. Chicagoans should be grateful to these musicians’ parents, Muti said. He then tasked the Civic Orchestra with a “mission”: “Words can be misunderstood. Music—never,” he said. He told the musicians that, as the future of classical music, it was their job to “reinstate” the values of society in a tumultuous world.